Apricots make me think of my Mum. She’s the biggest apricot fan I know and until last year I didn’t really get what all the fuss was about. Then I had a proper one. Not a dry, fuzzy one with an inside like loft insulation but a sweet, juice running down the chin, superbly ripe one. And everything changed. 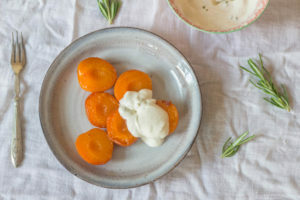 Honeyed Apricots with Rosemary Crème Fraîche might sound like an unusual combination but herbs and fruit work so well together and this is truly a winner. Ripe apricots would be fantastic for this dish, but if they’re a bit ropy then sizzling them in honey will only improve them. Halve the apricots and remove the stones. This was much easier than I thought it would be, the stones just fell out. Warm up a small frying pan (a griddle pan would be good if you have one) then add the apricots, flesh side down and let them sizzle gently for a minute or two. Flip the apricots over so they are skin side down and fry for another minute. Finally, flip the apricots once more and add the honey to the pan. Move the apricots round in the honey so they are nicely covered and faintly caramelised. Mix together the crème fraîche, rosemary and vanilla. Serve up the apricots and dollop the crème fraîche mixture over the top. This dessert is so summery it’s asking to be eaten outside with a lovely glass of dessert wine. The apricots are unctuously soft; they fall apart as soon as you dig your spoon in. Apricots and honey work so well together to bring some sweetness and coupled with the sharp crème fraîche it cuts through everything beautifully. The rosemary is distinctive but the faint whiff you get from it with the vanilla at the same time is just the best. I love herbs and fruit together and this combination of honey, apricots and rosemary is honestly one of my favourite puddings I have ever made. From slicing the apricots to sitting down to eat this for pudding takes less than 10 minutes and I can’t think of anything I’d rather eat under the shade of the tree in my garden. A simple yet wonderful dessert! I love a classy dessert like this! oh I love this Caroline, I did something similar with peaches and it was wonderful. Will have to try apricots my husband loves them and I bet I will this way. I love this idea – a simple yet elegant summer dessert! This is a wonderful fresh dessert perfect for summer. I like your photos too! Hah! The thought of one of those dry apricots that tastes like loft insulation is making me laugh. But I know what you mean! It’s hard to beat summer fruit when it’s perfectly ripe. 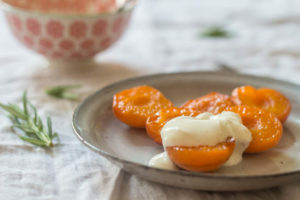 These honeyed apricots sound like a delicious summer dessert! I have to confess that I am not a big fan of apricot. But I love how wonderfully you have paired the fresh ones with crème fraîche. So want to try these! Oh fabulous recipe, love how the apricot is heated and served like this, very summery indeed. i was just in Austria and there it is apricot everything! So simple! So good! Really inspired dish — thanks. Just saw a recipe that’s similar to this but with lavender. I had already decided to try it for dessert so now I can compare both! Hurray! Apricots are my favourite fruit where we used to have an amazing apricot tree at the back. Sadly it’s died and I’m finding it hard to get good apricots during summer! WOW! Love how simple and delicious this dessert is! What a wonderful light summer dessert idea! I love this! What a fabulous dessert! I don’t think I’ve ever had a properly ripened, juicy apricot, but I will happily eat them dried or even out of the can. Hoping one day I’ll be blessed with some to cook with!